Homes after the fire in Patil Estate, Pune (India). Many members of one of the world’s largest waste picker organizations lost their homes to a massive fire in Pune, India. Fire is a major threat to waste pickers around the world, both at their work sites and in informal settlements where they live. A devastating fire has laid to waste over a hundred houses in the dense Patil Estate slum on the banks of the mula river in Shivajinagar. The slum is home to large numbers of waste pickers who had incrementally built their homes through years of work cleaning this city. Fire brigade authorities, municipal workers and the police along with volunteers from different organisations worked tirelessly to remove gas cylinders and did yeoman service in vacating the homes. Since it was daytime, the residents were out working and the children were at school and college so there was no loss to life. 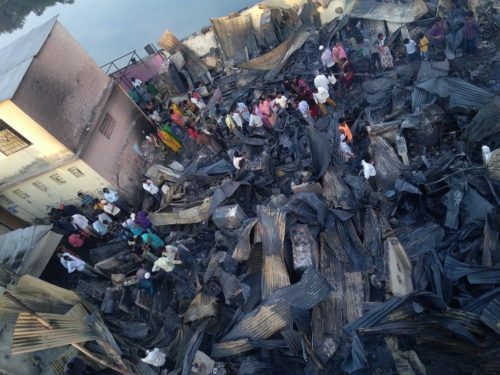 People lost everything that they owned in the blaze including their documents.. They rushed back top salvage what they could only to confront utter devastation. Among them was Rajendra Kamble who had scheduled a puja tomorrow for his newly renovated house. The business of picking up the pieces and putting their lives back together begins tomorrow. SWaCH appeals to residents in Shivajinagar, Aundh, Pashan, khadki and other places in the region to show compassion at this time. Please do not complain if waste waste pickers do not collect your garbage for the next two three days. Kindly bear with them and help them get their lives back together. Kagad Kach Patra Kashtakari Panchayat (KKPKP) welcomes any donations in cash or kind. Please call or SMS or Whatsapp Maitreyi on +91 97 65 999496 if you wish to donate. Please send an email to kashtakaripanchayat@gmail.com with the transaction ID once done. From SWaCH Facebook. November 28th, 2018. Homes after the fire in Patil Estate, Pune (India) beside Mula river. Call for help message from KKPKP and SWaCH.